MKR/STNL This luxurious coffee maker brews great tasting coffee at cup-a-minute speed. 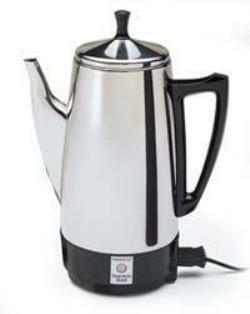 Makes two to twelve cups of rich, flavorful coffee, then keeps it piping hot automatically. Signal light indicates when coffee is ready to serve. Beautiful traditional design provides for elegant coffee service anytime. Constructed of durable stainless steel, even the filter basket and perk tube, for easy cleaning and lasting beauty. 120 volts AC, 800 watts.